Further information about ChyronHego and the company’s products is available at www.chyronhego.com. ChyronHego, a portfolio company of Vector Capital, is a global leader in products, services, and solutions for the sports technology and broadcast markets. 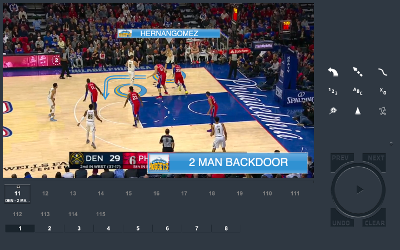 ChyronHego’s sports technology division specializes in creating, analyzing and distributing sports data and sports video, as well as empowering the visualization of this content for a wide range of applications. ChyronHego offers some of the industry’s most widely deployed sports technology solutions — including TRACAB™ optical and wearable sports tracking systems; and Coach Paint for video analysis. Headquartered in New York, ChyronHego also has offices in Sweden, the Czech Republic, Slovak Republic, Norway, Finland, Germany, the Netherlands, Denmark, Singapore, the United Kingdom, and Mexico. Photo Caption: ChyronHego’s Coach Paint telestration tool used by Washington Wizards.